There are few cultures whose values and beliefs are more diametrically opposite from modern American society than the Hopi culture, which puts group over individual, cooperation over competition, and simplicity over excess. For the last several hundred years, the Hopi have steadfastly maintained their traditions and resisted corruption of their stark desert homeland. The Hopi culture is constantly looking for new ways to resist the dominant economic, social, and political pressures of American society. Joan Timeche has spent her life working within her native Hopi Tribe and, more recently, within other Native American communities in Arizona to preserve the integrity of tribal life by using the tools of modern business and education. Joan was born to Hopi parents living off the reservation on the South Rim of the Grand Canyon National Park. The experience of growing up as a Hopi in a non-Hopi community influenced Joan’s sense of identity. “As an Indian, I experienced discrimination—encountering other people who would treat you like dirt, knowing nothing about you. I wanted to prove to them that Indians are not stupid,” she says. Throughout her childhood, Joan’s family returned to the reservation on weekends and during the summer to care for her grandparents, who lived in Old Oraibi, the oldest continuously inhabited village in North America. As children, she and her sisters and brothers resisted going back. “My father had to physically pick us up and put us in the truck sometimes,” she says. But as she grew older, she found her own commitment to the reservation and the traditional Hopi way of life. 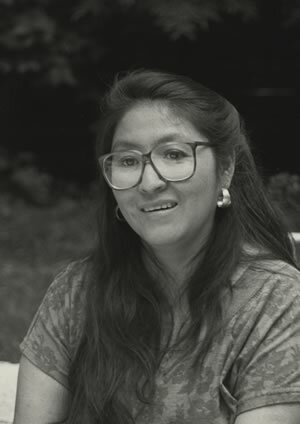 In 1978, after graduating from Northern Arizona University, Joan moved to the reservation. She worked planning supplemental educational opportunities for Indian students and then in the Hopi Department of Education. She became Director of Hopi Education, and turned her energies to preserving Hopi language and culture by obtaining the funds to construct the first on-reservation high school since the 1950’s. In 1990, Joan returned to Northern Arizona University to earn an MBA. She hoped the tribe could achieve the economic stability necessary for true self-determination. Recognizing that “there was not a lot of expertise in business and economic development” in many of the Arizona tribes, Joan joined the Northern Arizona University’s Center for American Indian Economic Development, which provides training and assistance to the twenty-one Arizona Indian nations and their people. “We have to create jobs so that kids can stay on the reservations,” Joan says. At the Center, she leads training workshops for individuals and tribal governments on marketing, accounting, tax strategies and other practical business skills. “Most tribes, whether they are ‘progressive’ or ‘traditional’ would prefer to have their own people run their businesses,” Joan says. Joan’s efforts are to retain money on the reservation rather than pouring it out into the surrounding non-Indian communities. On the Navajo reservation, Joan’s office helped start a towing business and a feed store, and changed the ownership of a local restaurant from non-Indian to Navajo-owned. In 1996, Joan was instrumental in organizing an historic three-day Native American Festival during the Arizona Super Bowl. The festival drew 40,000 people and provided a successful market for Indian artisans and craftsmen.